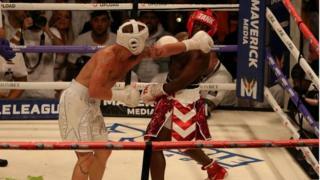 Amazon’s Twitch is facing criticism after reports that pirated streams of two boxing matches featuring YouTube celebrities that it hosted attracted more viewers than official channels. At one point, more than one million users were watching coverage of the KSI v Logan Paul and Deji v Jake Paul bouts on Twitch, according to the Verge. By contrast, YouTube’s pay-to-view stream peaked at about 800,000 viewers. Twitter’s Periscope also hosted pirated streams, but to a lesser extent. It is not clear how many people paid to use a special video feed provided as an alternative to YouTube. However, 15,000 tickets were also sold to spectators who attended the event live at Manchester Arena. Twitch has provided a brief statement. “Our community guidelines prohibit uploading any content that a person does not own, does not have the rights to, or are otherwise not authorised to use,” it said. Twitter has not issued a response. The amateur celebrity boxing matches had been billed as the “biggest event in internet history” thanks to the popularity and controversy of the British and American fighters involved. The show cost £7.50 or $10 to legally watch online. Some users who paid the fee reported experiencing technical problems, which may have spurred them to hunt out pirated versions. But social media posts indicate many more sought out the illegal streams from the start. Is the ‘biggest event in internet history’ a sign of the future? 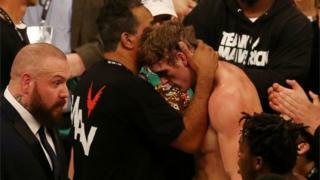 What did professional fighters think about the match? Many of the Twitch pirates used fake titles to hide their streams, such as “Free Fortnite skins” and “Playing new UFC game”. But screenshots indicate some of the more popular examples still managed to attract hundreds of thousands of viewers simultaneously. This prompted criticism of both Twitch itself and those who had tuned in. Disappointed in @Twitch today for not actively banning streamers rebroadcasting the #KSIvLogan fight. People don't seem to understand that HUGE events like this cost MONEY to run. Watching it 'Illegally' doesn't do anyone any favors. I think the main point to be made is that @Twitch Sat idle while this was happening. Why should the people who've spent the last 6 months training to put a good show on for YOU, have to then pay out of their own pocket so you can watch it at no cost. I understand that some people may not be able to afford to watch it, but they could always watch it with friends.. This happened during the McGregor/Mayweather fight. This happened during the world cup. It happened again during KSI/LP. It cost YouTube at least a few million dollars in losses. But one expert suggested it would have been a surprise if Twitch had done more. “It’s actually very difficult to prevent the piracy of a live event where thousands of people are uploading new versions of the stream,” commented Mark Mulligan from the consultancy Midia Research. “Often it’s actually humans – rather than just algorithms – that are looking for them, and to be fair to Twitch a good number did get taken down. 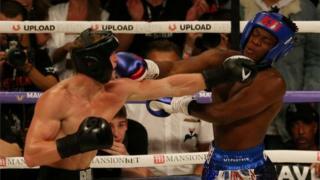 After scoring a draw on Saturday, KSI and Logan Paul are set for a second fight in the US. Meanwhile Jake Paul, who won the undercard match, has challenged the singer Chris Brown to a bout. This should give the YouTubers and their entourage a chance to make up any lost earnings from the weekend. But Mr Mulligan suggested no-one involved was likely to be feeling out of pocket. “It was noteworthy that Jake Paul announced a new clothing range after his fight,” he commented.